VIDEO ABOVE: NEVADA TAKES ACTION AGAINST CRIMINAL GUARDIANS; WHERE IS MICHIGAN ATTY. GENERAL BILL SCHUETTE? Judge David Braxton to conduct hearing on Wanda Worley’s petition to remove Mary Rowan as her guardian on Mon. 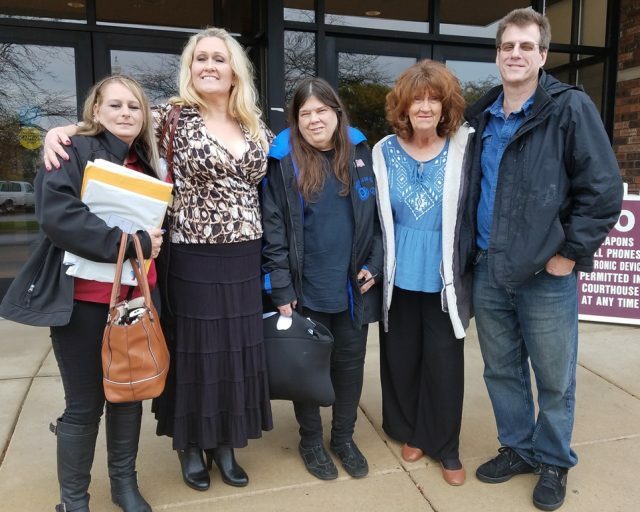 Nov. 6, 2017, 11 a.m.
(L to r) Kelly Hammer, Sharmian Sowards, Debbie Fox, Wanda Worley, Randy Robinson after Sowards’ victory against abusive guardian Mary Rowan; Fox and Robinson’s mother Gayle Robinson has been another victim. Families and wards dealing with Mary Rowan are beginning to unite. Woodhaven, MI – Thirty-Third District Court Judge Jennifer Coleman Hesson peremptorily dismissed assault and battery charges against Sharmian Sowards Nov. 2. 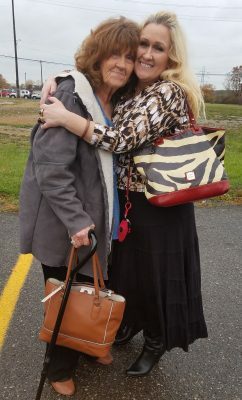 The charges were brought after Sowards tried to defend her mother Wanda Worley against an illegal seizure by notorious guardian Mary Rowan Oct. 6, 2016, from their Brownstown Township home. Sharmian Sowards and mother Wanda Worley embrace after victory Nov. 2, 2017. 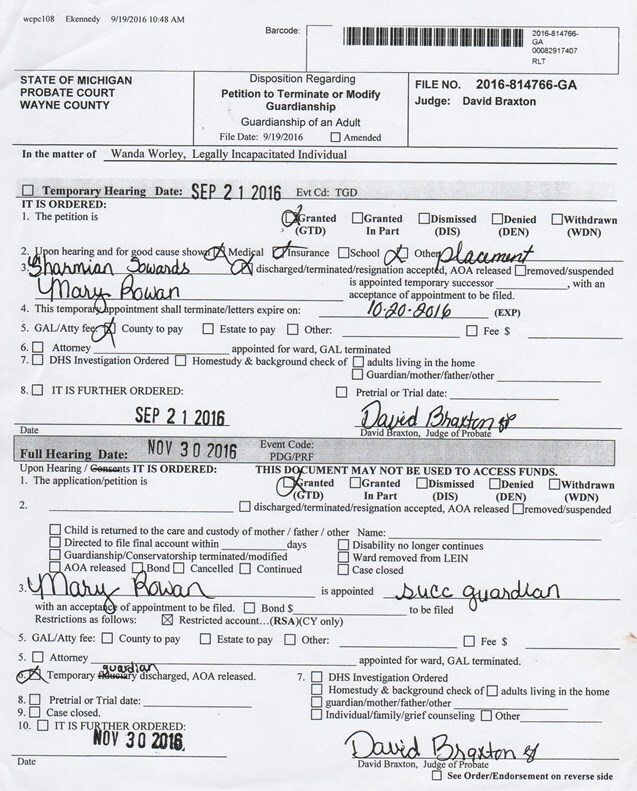 The Nov. 2 criminal court hearing is to be followed by a hearing Nov. 6 at 11 a.m., on a petition brought by Worley to remove Rowan as her guardian. It will take place in Wayne County Probate Court in front of Judge David Braxton, Room #1303 at the Coleman A. Young Municipal Center. Braxton is to consider a so-called “Independent Medical Evaluation” (IME) of Worley done by the Probate Court’s regularly-appointed psychologist George Fleming, Jr, Ph.D.
Worley has been denied access to his report, although it is her own medical record. Fleming is not a psychiatrist, and appears to have worked primarily at Probate Court since his graduation as a Ph.D.
Sowards represented herself during the jury trial in 33rd District Court in Woodhaven, MI. 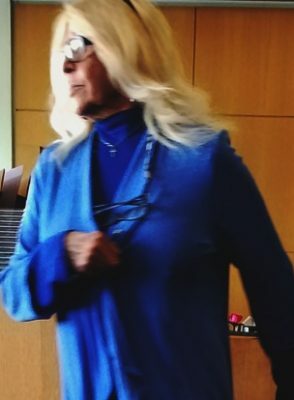 During her cross-examination of the complainant Rowan, she asked whether she knew Debbie Fox and Randy Robinson, children of another Rowan ward, Gayle Robinson, who was forced from her home in Westland to a nursing home. They were waiting to testify about injustices in their mother’s case. Rowan said she did, but then blurted out, “Why do you have a reporter in the court who doesn’t report the facts?” referring to this reporter. 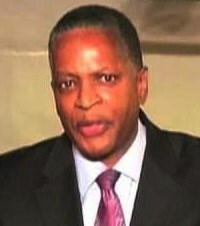 She later condemned Rowan’s challenge to the media’s integrity. Judge Hesson excused the jury and held a half-hour conference in chambers with assistant prosecutor Kathleen Tulacz and attorney Kelly Leimback, who assisted Sowards during the trial. When court reconvened, AP Tulacz announced that the “complainant” Mary Rowan no longer wished to participate in the proceedings and moved for dismissal of the charges. Judge Hesson firmly ordered the charges dismissed “with prejudice,” meaning they cannot be brought again. She described Rowan’s first attempt to seize her mother and place her in a group home. Sowards said she called an ambulance to take Worley to Wyandotte General Hospital Sept. 7, 2016 because of ailments she was suffering related to previous surgery on her sciatic nerve. However, doctors there admitted Worley to the psychiatric ward, then refused to let Sowards see her mother. Sowards said she was concerned that they were giving her mother addictive pain medications from which she had been helping wean her. During cross-examination, Rowan denied that she herself had seen Worley in the hospital. But she admitted that “my provider Wendy Barber met your mother there and said she was an appropriate candidate” to be placed in Barber’s group home. Rowan said they had planned to take Worley directly from the hospital to the group home. Sowards told VOD earlier that she had called an attorney with Metro Detroit Legal Services, who intervened to have Worley discharged from the hospital and placed back with her daughter. Rowan then went to Sowards’ address in Brownstown Twp. twice, where Sowards denied her admission, saying she was trespassing. During the second occasion Oct. 6, Rowan said Sowards “drenched” her front and back with water from a garden hose, the basis for the “assault and battery” charge. There was no allegation of any physical contact, but Rowan said she felt “intimidated” by Sowards. Rowan said Wayne County Probate Court Judge David Braxton appointed her as Worley’s temporary guardian Sept. 21, replacing Sowards’ March, 2017 appointment. She said she showed her “letters of authority” to a Brownstown Twp. police officer, after which he persuaded Worley to go with Rowan for only a few days. Rowan said she did not need an “Order of Removal” to take Worley, which she did with no prior notice and without any of her clothes and possessions, violating her duties as a guardian. Worley told VOD she was placed at a bedbug-ridden group home at 12317 Monica in Detroit. She said that wards in the home were not fed regularly, were given only $40 a month from their social security checks, and that workers there frequently went unpaid as well. Sowards did not find out where her mother was until months later. 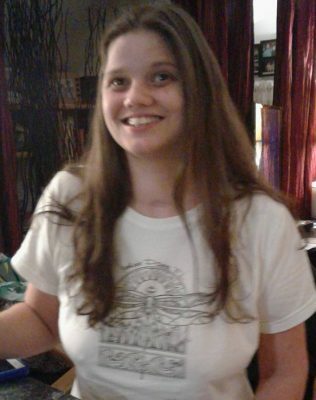 Worley later left the group home on her own. Rowan was never appointed as “conservator,” to handle Worley’s funds. Sowards and Worley went to the Social Security Office Oct. 30 to have Worley’s payee status, as well as the amount of funds seized from her by Rowan, returned to her. They told VOD that the Social Security staff said they would contact the federal Office of the Inspector General to investigate how Rowan got access to Worley’s funds. At the end of the hearing, Judge Hesson asked security to watch while Rowan left the court premises in her car, then allowed other attendees to leave. Rowan evidently is affililated with numerous “group homes,” likely unlicensed, in the Detroit area. Worley told VOD she was transferred among several after the power went out in the Monica home. Unfortunately, as in Worley’s case, Judge Hartsfeld has not terminated the court’s supervision of Brockington, and is awaiting results from so-called “confidential” medical documents wards are not given access to. Perhaps the psychologists Wayne County Probate Court is using ought to pay attention to the video below, also from Nevada. This entry was posted in Uncategorized and tagged ENDGUARDIANABUSE, FreeGayleRobinson, FREEKRISTINABROCKINGTON, FREESHARMIAN, FreeWandaWorley, JAILMARYROWANJOHNCAVATAIONOW, JUSTICE4MAILAUNIWILLIAMS, Justice4RaymondDavis. Bookmark the permalink.